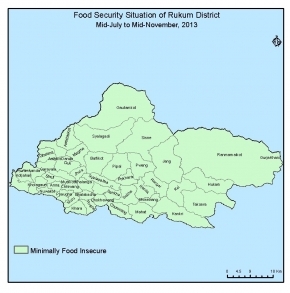 The food security situation of the district is minimally food insecure (phase I). More than 80% people of the district are able to meet their basic food needs. More than 50% HHs have food stock for more than 4 months in cluster A and up to 4 months in cluster B. The production of the summer crop maize and paddy was measured 95% & 11% more than the last year respectively, People earned Rs. 7 Karod 44 lakh from the agriculture products (fresh vegetables, fruits, potato) mainly in cluster A, People of the district, also became able to earn Rs. 70 karod from the livestock and livestock products, Rs 850,000 from the sale of NTFPs. People have been benefited getting subsidized food from the NFC depot (1797 Qt.). People also got chance to earn money from the CA election activities. Road head markets are well functional. People have in-migrated from India and other third countries as tradition in all over the district from which people imported the remittance. Market food stock is available but the local markets are far from the each community in cluster B VDCs. Production of maize in cluster B, measured up to 30% less than the normal year so the HH of the cluster B have minimal food stock of summer crop. Major cash crop beans in cluster B decreased by more than 50 % due to the affection of Khapade kira. In overall, the food security situation of the district is minimally food insecure (phase I) in this reporting period. People will have remaining summer crop harvest in this coming cycle. Market stock will be normal as the motor roads will be functional around the cluster A and nearby the cluster B. Normal employment opportunity will be available. People will have earning from the sale of cash crops and few NTFPs like Chulte, Bhutle, Sugandawal and livestock products. The overall food security situation of the district will be minimaly food insecure in the coming cycle. In cluster B VDCs, people are far from the road/market access and they only got moderate summer crop maize harvest due to the disease affection on maize crop in its growing period. People did not take normal income from the sale of major cash crop beans this year due to the heavy loss on its production due to the disease in its growing stage. Thus the outlook of the cluster B will deteriorate in coming cycle.